ADATA delivers its DashDrive UV110, a new line of "colorful" USB 2.0 drives. 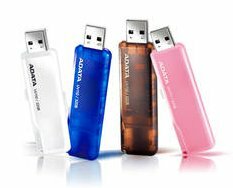 ADATA™ Technology today announces the launch of the DashDrive UV110, a slim, compact USB 2.0 flash drive which comes in a range of four charming colors: navy blue, milk white, cotton candy pink, and caramel brown. This colorful USB 2.0 flash drive offers simple data storage capabilities while still staying fashionable. The UV110 can match anyone's personal style, and can be stored easily in your pocket, purse, or bag thanks to its small footprint. When stored away, users don't have to worry about losing the cap for the housing of the DashDrive UV110 includes a thumb-actuated sliding USB connector. The integral strap hole even allows users to attach this elegant flash drive to their keychain or hang around their neck. The UV110 is poised to appeal to those who are looking for an economical but high-value storage device that can match one’s personal style. The DashDrive UV110 is available in four capacities: 4, 8, 16 and 32 GB.